"Delicious and easy to make. You can spice it up as much as you want with hot sauce. Serve with tortilla chips." Heat olive oil in a skillet over medium-high heat. Cook and stir chicken and onion in hot oil until the chicken is no longer pink in the center and the juices run clear, 7 to 10 minutes. 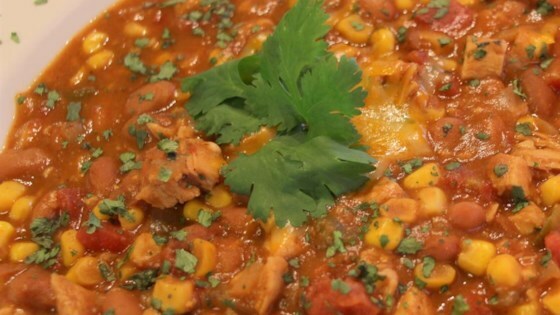 Stir refried beans, corn, chicken broth, taco seasoning, picante sauce, and garlic powder together in a slow cooker; add the chicken and onion mixture. Cook on Low until the chicken pulls apart easily with 2 forks, 3 to 5 hours. Shred chicken in the soup with 2 forks. Continue cooking for 1 hour more. Ladle into bowls and top with Cheddar cheese. This is quite close to how I make Tortilla Soup and it's great. The beans make the soup thick and filling and the spiciness is tangy and warm. We had a groups friends over for lunch including one friend from Mexico and everyone was raving about it. Definitely a keeper recipe. This was amazing! We even tried it with left over spare rib meat instead of chicken...and it was incredible!